As a Mom that doesn't like doing laundry, I prefer to throw all the clothes in the washer at once. In a perfect world, we could wash all of our clothes together and none of them would run/bleed and you'd never have that random pink sock. Purex's new detergent is helping us take our next step toward that perfect world with their No Sort Laundry Detergent! 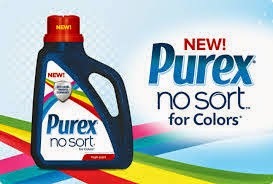 Introducing NEW Purex® No Sort™ detergent for Colors! Purex® No Sort™ detergent features a breakthrough Anti-Color-Transfer Technology™ which traps loose dyes in the wash, and prevents them from settling onto other fabrics—leaving your clothes bright and clean without color bleeding accidents. You see, I don't want to sort my laundry. It annoys me. I want to be able to throw all of the children's clothes in the washer, add soap and my in-wash enhancer and go on my merry way. I'm so happy that Purex has come out with a product that we can do that! 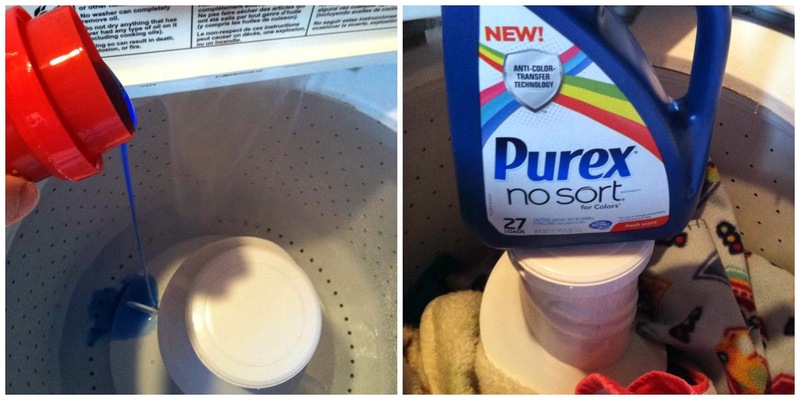 With Purex No Sort for colors Laundry detergent, the Rules have Changed! The soap traps loose dyes and reduces color bleeding accidents. Purex claims to not perform miracles, so you need to follow their words of advice; wash strongly colored fabrics or new pieces of clothing (especially jeans) separately at least 5 times before doing a mixed color load with Purex No Sort for Colors detergent. Interested in winning a few coupons to try out this wonderful new detergent from Purex? Dates: Starts April 23, 2014 2:00 pm EST. Winner will be chosen May 3, 2014 11:59 pm EST. Disclosure: Sweet Cheeks and Savings teamed up with Purex for this giveaway. Other participating bloggers are not responsible for choosing the winner or shipment of product. They have not receive any compensation for this post. When it comes to dog towels, I don't sort, I just wash them all together because I don't really care what they end up looking like. However, my clothes I'm a little more paranoid about. But, I'd love to be able to try the detergent out with my clothes. It sounds like it'd be so much easier to do laundry! I don't know if I could not "sort" my wash. Call me crazy, but I like to do it. It is calming for me.Structure I guess. Now for my teenagers and husband it would be a great concept and help them very much. I like the idea of not having to sort sometimes. It seems like there is never quite enough for a decent sized load so you save it up and wait until you have enough, then all of a sudden there are 5 loads waiting to be done! No sorting when washing sounds nice. I have to much to do in a day so it helps a bit. Want to start hanging clothes outside already! I still sort my clothes out of habit. No sorting!! Talk about saving time. I'd love to try this and see for myself. It would so save time..(my son mixes it all together anyways)! No i don't like sorting. I just like to hurry-up and get it over with! I feel great about. Though I admit I've been throwing my clothes together for years, except for whites sometimes when I use bleach. Not sure if my comment posted or not, I love that the detergent is specially formulated so we don't have to sort. I've been throwing my lights and darks together for awhile. Opps. I really hate sorting colors - I love that this would make it so that I don't have to sort and can have more time to do other things! my husband would have his underwear on his feet or who knows what. he's spoiled to clothes & underwear being folded and in the drawer. I would love to try this!! !I love Purex products. if I win can you contact me at Allison_99_01@yahoo.com instead of google. anything that making laundry easier is a blessing! I just wash for me and hubby so a load a day, unsorted, works for me.